The first chapter of the book is the Player’s Guide to Ptolus (also available for free online, but in B&W). It gives an overview of the city, the people, and the world in which the city resides. Next, the book goes on to give more information about the world around Ptolus: Praemal. Monte gives just enough information to get you started here. It’s obvious he intends for individual DMs to customize the world of Praemal to fit their own styles and campaigns. Praemal isn’t the focus of this book anyway. Next, the book details the major organizations that can be found in the city, from the benign to the malevolent. This is where you start to find really great ideas for adventures and scenarios. After the first three chapters, the next several chapters constitute the best, and most detailed guide to a city ever detailed for D&D. Every region of the city gets its own section complete with important locations, rumors, adventure hooks, important NPCs, and how it all fits in the history of the city. The maps are well done down to the individual buildings and are supplemented with other maps throughout the book detailing typical houses, stores, apartment buildings, guild halls, government buildings, etc. This section is lovingly written almost like a travelogue. Once you read through it a few times, it will seem almost as though you’ve been there. And if it doesn’t, you’ll certainly want to go there. 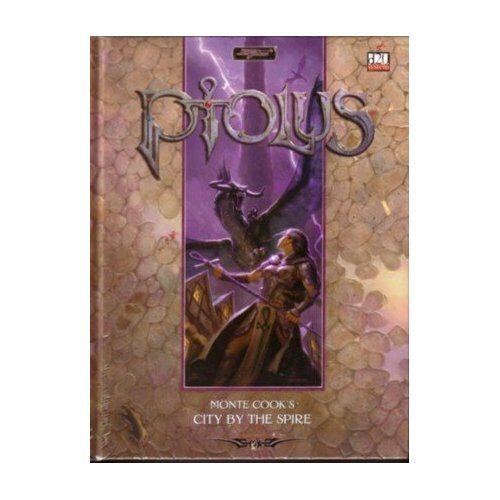 After the description of the city proper, comes a chapter that talks about running a campaign in Ptolus. It includes hints on how to run urban adventures, notes on special equipment and other items you’ll find in the city (firearms! ), and especially helpful: a whole section on LIVING in Ptolus, down to how much it costs to rent a flat or home, or buy one and how much money you’ll need to earn per month to enjoy a certain standard of living. This type of detail really makes urban campaigns stand out. All too often, a game session ends with characters “making camp” until the next time all the players meet. Ptolus makes it easy to say the character just go home and deal with their day-to-day life while allowing the players a say in just what that day-to-day life entails. After the DM Companion section comes a section on what is beneath the city. Since Ptolus was the original playtesting campaign for the 3rd edition of Dungeons & Dragons, it wouldn’t be complete without…a dungeon! Of course, the dungeon in this case is an interconnect series of sewers, natural caverns, what was on the land before the city was built over it, mad wizard’s labyrinths, an abandoned dwarven city, and much more. You can use all of it, or none of it. It’s called “The Dungeon” only to make it easy to reference. How it affects the city, and how the city affects it is meticulously detailed, yet it is left open for DMs to insert anything they want down there. If you wanted to insert the entirety of the “World’s Largest Dungeon” beneath Ptolus, you could easily accomplish it. I love how it’s integrated, yet modular. After “Beneath the Streets,” come chapters with adventures for the city setting. The first of these is a series of low-level adventures intended to get the players familiar with the setting and set up some recurring nemeses and allies for the characters. Once that particular adventure path is finish, DMs can segue into Ptolus’s companion product “The Night of Dissolution,” or go off in their own direction because the following chapters detail what is on the spire, by which the city resides: two fortresses of ultimate evil. These are high-level (near epic) areas which spell certain death to anyone ill-equipped to explore them. They are intended as end-game areas in which a campaign can come to a glorious or horrible end. Monte gets very creative with the evil here, and it’s easy to imagine your players screeching in terror as they flee, flee, flee. Finally, the product includes an index. A USABLE index, a rarity in this industry, it seems. I can find really no fault with this product. The editing, by Sue Weinlein Cook, is superb (of course, it’s not perfect, no book is, particularly in its first printing). The layout makes it easy to read and reference, particular the use of sidebars to detail what gather information checks might reveal about individuals or locations, and other fun notes, including Monte’s comments on how his campaign dealt with certain NPCs, organizations, or items. The binding is heavy-duty, sturdy, and shows no signs of breaking down after 6+ months of constant usage (plus years of ownership). The book is heavy, though. Carrying it around all day in a backpack WILL cause pain. But it is an 800+ page book, after all. If you can find a copy of this, buy it. If you can’t, get the PDFs. If you love D&D, you’ll love Ptolus.